Peach Cake with Caramel Frosting — knead. bake. cook. On the other hand, layer cakes are not a summer thing. For one thing, frosting. Frosting does not like the heat and when it is 110ºF out, cakes aren't going to survive unless in a well air-conditioned environment. But, coffee cakes and upside down cakes? Those are definitely summer cakes, because like the things in the pie family, they also use up fruit but contain no frosting whatsoever. So what about cookies, brownies, muffins, breakfast pastries and the like? Those are kind of all-year-round things, depending on whether or not there is fruit in them, or if it's a holiday cookie swap or someone’s birthday, or if I am just craving that particular baked good. Since it has cooled down to a balmy 85º here in September in the Sacramento Valley, what better way to celebrate than by making a cake (the last one I made was in April) and a cake that honors the end of summer! This was inspired by Adriana's Peach Maple Yogurt Cake but I added more layers and changed up the frosting. I found myself with some caramel sauce from work + I loved the frosting on this cake, so I just put them together. I wanted maximum peach-ness so I sliced the each of the original two layers in half. In retrospect, I would totally add more of the Peach Puree but I wasn't sure whether or not it would overflow or drip out when sliced. None of these things happened so if you would like more peach flavor, be sure to add a bit more puree between the cake layers. I also used this opportunity to practice buttercream roses. The last time I tried to make buttercream roses was at a cake decorating class at Michael's that I took when I was in middle school. 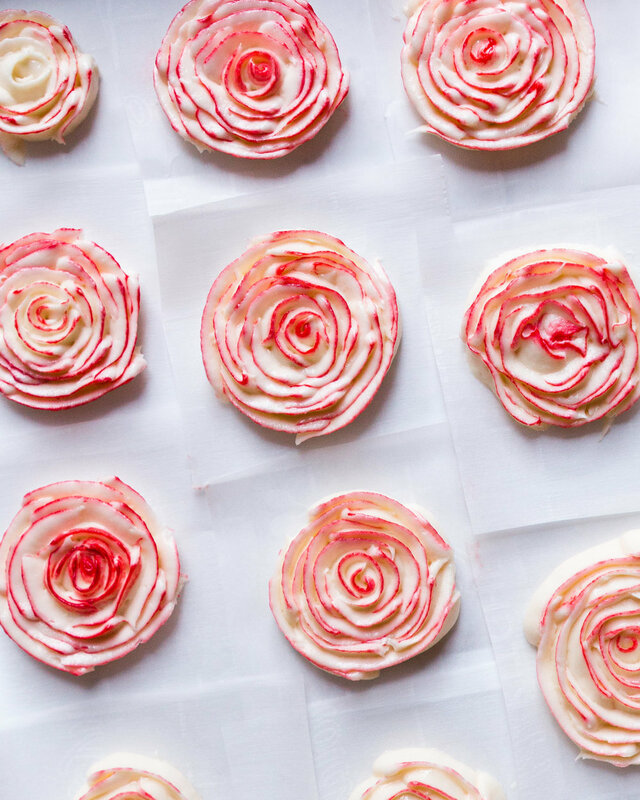 I thought that process was incredibly hard and it turns out that age, patience and Instagram Stories tutorials are all that one needs to be okay with piping buttercream roses. Like kneading bread or folding wontons, I found it quite therapeutic and will do it again when I can. Perhaps you've found yourself with a few extra summer peaches. Maybe they are good, maybe you know the season is dwindling down, and maybe they aren't that great raw. And maybe it's just cool enough to bake and frost a cake. If you leave it as is and don't add the buttercream roses, it will be just as good. Because hey, every time I make a new cake, I become more okay with the idea that cake can almost be just as good as pie. And now, I am ready to make fall things. The Peach Puree can be made ahead. You will also not need all of the Peach Puree for the cake. I made extra to add to my breakfast yogurt in the morning. Feel free to halve this recipe if you don’t desire to have that much extra. Store extra Peach Puree in an airtight container in the fridge for up to a week or freeze for several months. After baking and slicing, cake layers can be frozen in advance. Wrap tightly with plastic wrap, being sure to place a layer of plastic in between each layer. Place in a Ziploc bag and freeze for up to 3 months or the day before assembly for ease of frosting. Place blanched peaches in a food processor and blend until smooth. Pour into a pot and add lemon juice, granulated sugar and salt. Whisk to combine and bring to a boil. Reduce to a simmer and cook until volume has reduced by half, whisking occasionally. This can take up to 30-40 minutes. Be careful, it does like to pop and spray. Cool completely before ready to frost the cake. Preheat the oven to 350ºF. Butter and flour the bottom and sides of two 8-inch cake pans and then place a parchment round on the bottom. In a medium bowl, whisk together all-purpose flour, baking powder and salt. Measure out the yogurt and milk and whisk it together until smooth. In the bowl of a stand mixer, with the paddle attachment, add the butter and sugar. Beat until light and fluffy, about 2 minutes. Add the eggs and vanilla extract. Beat until combined about 30 seconds. Next, alternating between the dry ingredients (3 additions) and yogurt mixture (2 additions), add them to the butter mixture until combined. Scrape the bottom of the bowl just to make sure there aren’t any flour-y bits hiding. Divide amongst the two prepared cake pans and transfer to the oven to bake for about 25 to 30 minutes, until a skewer inserted into the center comes out clean. Allow to cool in their pans for 5 to 7 minutes, until inverting cakes onto cooling rack. When completely cool, divide cake layers in half using a serrated knife. Using a stand mixer, beat together the butter and cream cheese until smooth. With the mixer on low, gradually add the confectioner's sugar until incorporated. Turn the mixer to medium and mix until combined. Add in the remaining ingredients and mix until smooth. Add more/less caramel, sugar, and milk until desired thickness and sweetness is achieved. Reserve ¼ of the frosting for buttercream roses if desired. Place ½ cup of frosting in a piping bag with Piping Tip #12 (or thereabouts). Place one cake round half on a cake stand or serving plate. (Optional) For clean edges, place torn bits of parchment paper under the first layer so that an inch or so is sticking out. Overlap parchment paper pieces all around the edge of the first layer. Frost the first layer and then pipe a circle of frosting around the edge. This is your dam to keep the Peach Puree from leaking out. Spoon 2-3 tablespoons Peach Puree in the middle, spreading to the edge of the frosting dam. Place second cake layer on top and repeat this process one more time. Place the final cake layer on top. Lightly frost the outside of your cake, sealing everything in and frosting down to the base/parchment pieces. There is no need to frost it fully yet or for it to be perfect. This is your crumb coat to help with fully frosting the cake. Place cake in the fridge for about 30 minutes or so to solidify the crumb coat. 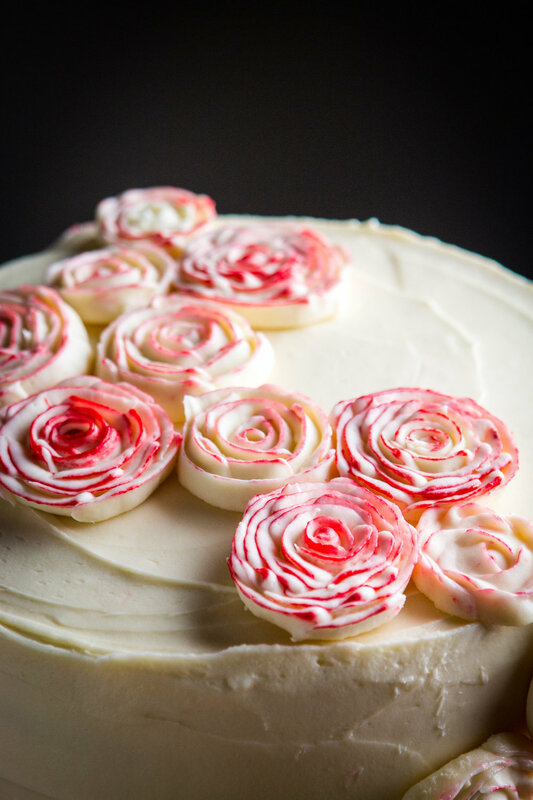 If desired, make buttercream roses with Piping Tip #104. Cut approximately sixteen 2-inch x 2-inch parchment squares and set aside. Place a dab of frosting on a frosting nail to secure each piece of parchment. To make buttercream roses, I used this tutorial for directions. For ease of transfer onto the cake, especially on a warm day, freeze buttercream roses for up to an hour. To finish frosting the cake, remove cake from fridge and add the rest of the frosting. Carefully remove the parchment bits from the bottom. 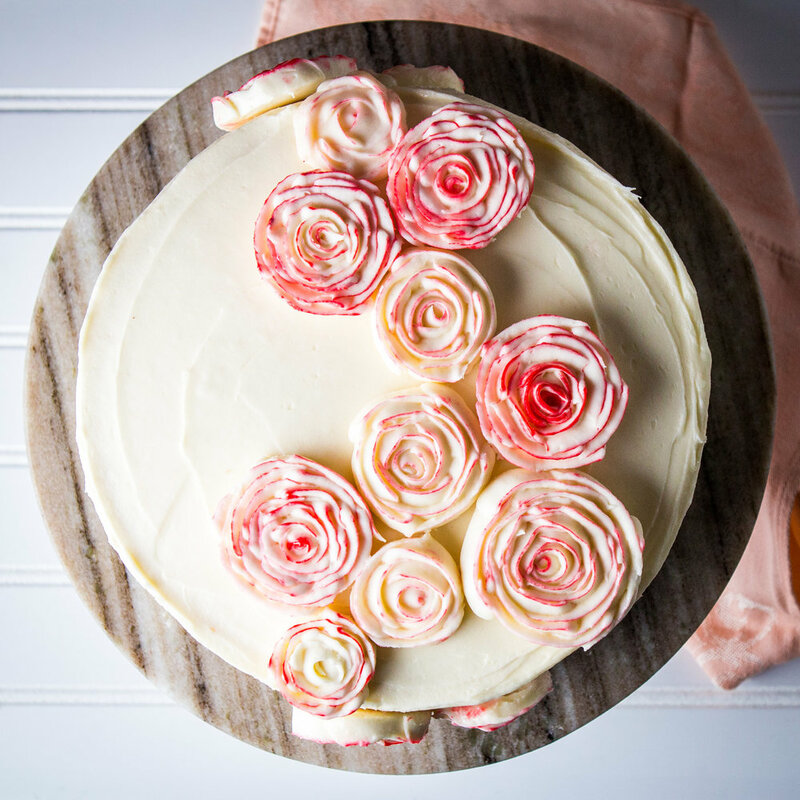 Top with buttercream roses and your cake is now ready to eat!